Known as the Hendrix Jensen at Jensen Motors, the last Jensen FF MK.I made [chassis number 119/195], had actually been purchased by Mitch Mitchell, the drummer for ‘The Hendrix Experience’. That said, Hendrix’s girlfriend, Kathy Etchington, remembered how Hendrix would drive the FF when ever he was given the chance. The Museum has managed to piece together the history of this famous car. Born in 1946, Mitch Mitchell’s career was to be within the world of rock & roll. As a teenager, he joined the ‘Coronets’, who were Chris Sandford’s backing group. The group managed one major hit song, “Not Too Little, Not Too Much” but disbanded shortly afterwards. Mitchell continued his musical career as a session drummer, working with groups such as The Who, The Riot Squad, and Pretty Things. The Georgie Fame & The Blue Flames photographed in 1965. Mitch Mitchell to the centre with glasses. In 1965 Mitchell joined Georgie Fame’s group, ‘Georgie Fame and the Blue Flames’, which he stayed with until October 1966. In October of 1966, Mitchell met up with Chas Chandler, the up and coming record producer & band manager. Chandler and Jeffrey photographed in 1967. Chandler had been the bassist with The Animals, but by 1966 had become the co-manager for the ‘Jimi Hendrix Experience’, along with Michael Jeffrey. Talks with Chandler and Jeffrey resulted in Mitchell leaving the ‘Blue Flames’ and joining the ‘Jimi Hendrix Experience’. The contract Mitchell signed, would have one bitter sting to its tail. To all intents and purposes the contract commited both Mitch Mitchell, and Noel Redding, to be paid employess of ‘The Hendrix Experience’. This would later have financial repercussions for Mitchell after the death of Hendrix. Two successful songs, “Hey Joe” and “Purple Haze” were brought out shortly after Mitchell joined them. “Hey Joe” made it to number six in the pop charts, and the now iconic “Purple Haze”, which came out in spring 1967, made it to number three. Chandler was later to state, that the basic track was recorded in four hours. Multitrack recording technology allowed engineers to record and complete additional parts on the final master. Chandler and Hendrix continued to develop the song. Hendrix, together with Chandler, were striving for a certain sound, and just kept going back in to the studio, two hours at a time, trying to achieve it. Eventually, after some days, they had the sound they wanted. The popularity of “Purple Haze” meant that ‘The Hendrix Experience’ was momentarily in the money. The Hendrix Experience. 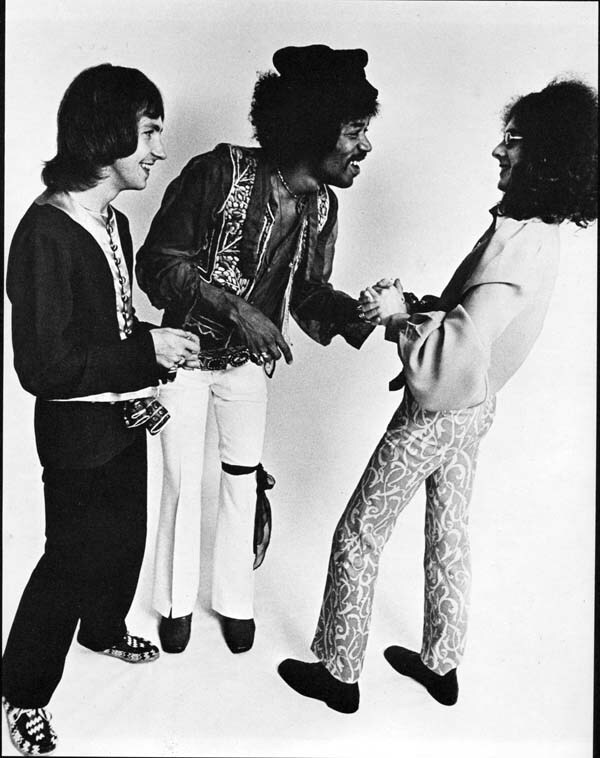 Mitch Mitchell, Jimi Hendrix, and Noel Redding. Finances within the Hendrix group were always up and down, but during the up times, Mitchell (in that time honoured ‘Rock & Roll’ tradition) indulged his passions for sports cars, drugs and alcohol. It was during one of these ‘up’ times that the Jensen FF was ordered. The car had been especially ordered during 1969 in a unique purple metallic finish. Mitchell’s choice of colour was undoubtedly paying homage to the “Purple Haze” hit. Although the FF was for Mitch Mitchell, it was his father, John Mitchell, that ordered the FF via the London-based Jensen distributors, Charles Follett. John Mitchell ran a sports car sales business, called Four Flags Racing Ltd, based in Staines, Middlesex. 119/195; by coincidence the last MK.I Jensen FF chassis made; was allocated for Mitchell. The completed car, resplendent in it’s metallic purple coachwork, was delivered to Charles Follett in December 1969, ready for collection by Mitchell. Mitch Mitchell had been driving a yellow E-Type Jaguar, and it is thought the Jaguar was disposed of via his father shortly after purchase of the FF. Immediately after taking delivery of the distinctive purple Jensen, Mitchell had a set of minilite wheels fitted. Hendrix’s girlfriend, Kathy Etchington, remembered the wheels, recounting to Museum curator, Ulric Woodhams, “Mitch had these special sporty looking ali wheels put on his Jensen, directly after collecting the car. He loved those wheels.” 119/195 was all set for the inevitable punishment it would receive. Back at the Jensen factory, 119/195 had become known as ‘The Hendrix car’, with the association of Mitch Mitchell and the Hendrix Experience. The unique purple colour of the car, also reminded staff of the famous Hendrix hit “Purple Haze”. In fact many at the factory, thought Hendrix himself was really the driver of the ‘Purple FF’. 119/195 was involved in at least two accidents ( and that was to the factory’s knowledge). 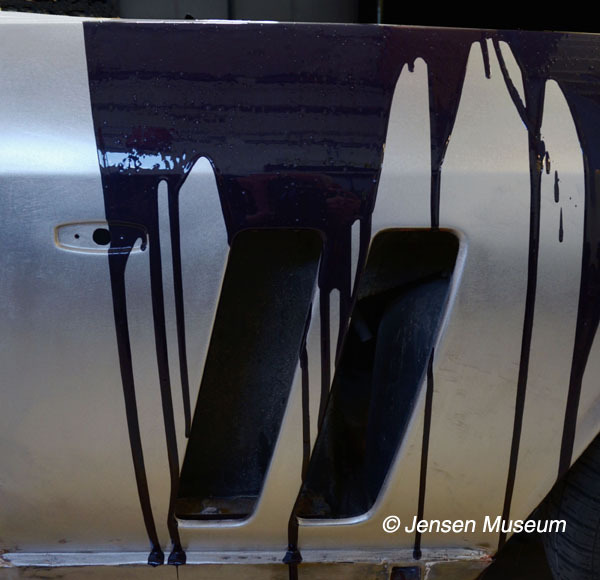 The first accident happened at the beginning of April 1970, this was to the front end, repairs were undertaken at the Jensen factory. Meanwhile Mitchell had a heavy tour itinerary, starting with the Los Angeles Forum, California. For the next two months, ‘The Hendrix Experience’ were performing across America. Having just returned to England, from a performance in Florida, Mitchell picked up his FF on the 7th July. The 1970 Isle of Wight Festival. Eddie Buckley had joined forces with the Foulk brothers. Originally brought in on the 1968 Festival to undertake all the printing work (Buckley owning a printing company). 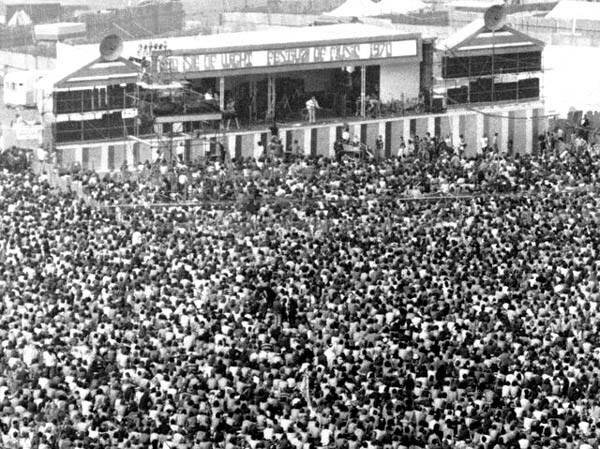 The 1968 Festival hadn’t made any money, so the Foulk brothers asked Buckley if he would like to come in with them financially. One of the first Festival money spinners created by Buckley was bringing in Ski Yoghurts. That was very successful, and brought in a completely new revenue stream. 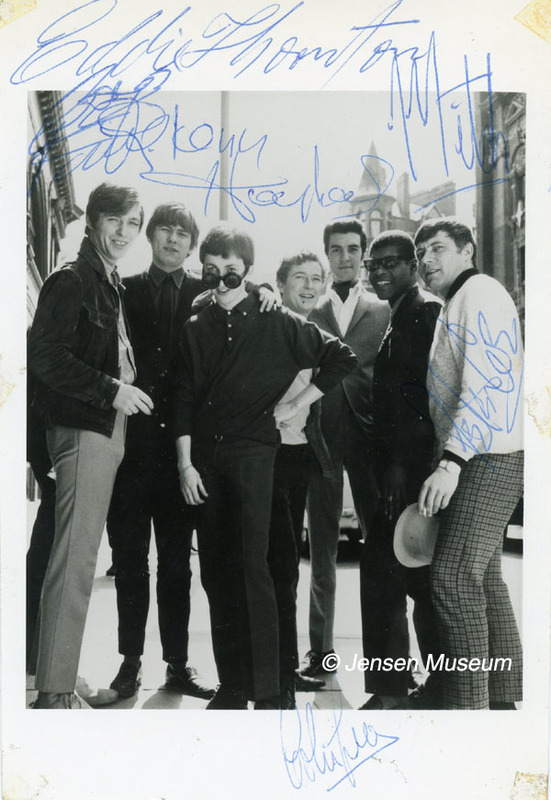 At the 197o Festival, Buckley had met up with the Hendrix band, and ended up talking for ages to Mitchell about one of their mutal passions – cars. A discussion had turned to Mitchell’s revolutionary Jensen FF. The outcome was Buckley saying to Mitchell he would love to buy the Jensen from him. Mitchell wasn’t ready to sell, but promised him first offer, as and when he was going to part with it. After the Isle of Wight gig, the Hendrix Experience flew over to Sweden. Once again the group provided a lack-lustre performance, with Hendrix in particular looking tired. After Sweden was Denmark, and then Berlin in Germany. Although the Denmark gig fared no better than the previous two, the Berlin gig was played to a far better standard…momentarily the Hendrix flame was back. 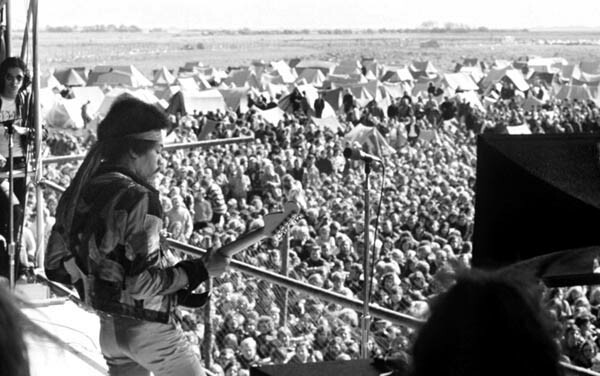 From Berlin, ‘The Hendrix Experience’ were booked to play at the Love & Peace concert, which was being held at the north German Isle of Fehmarn. The Hendrix group were set to play on Saturday 5th September, however, due to gale force winds, the concert was cancelled until the Sunday. There was an ominous air on Fehmarn during the Saturday. Hells Angels, along with militant groups, had arrived, many with weapons. Over 200 musicians were cooped up in Fehmarn’s largest hotel, and things were looking decidedly grim. With the gigs cancelled until the next day, the bar had been drunk dry – literally, and later that evening fighting broke out between musicians; the bar area was completely wrecked. Mitchell called Hendrix to his room and together they tried to calm Cox down, spending over three hours with him. The following day it transpired a lot of violence had taken place during the night. The Hendrix Experience playing on the Sunday. They prepared to leave Fehrmarn as quickly as they could after their session. On the Sunday morning, ‘The Hendrix Experience’ arrived at the concert arena by car. As they got out of the car, a plank of wood with 6” nails was thrown at the group by Hells Angels, hitting Gerry Stickells, ‘The Hendrix Experience’ Road Manager. The group decided to get through the gig as quickly as possible and get off the island. Back in England, all was not well. Hendrix was still depressed and Cox was suffering from what could only be described as paranoia. The group needed a new base guitarist. Mitchell, Hendrix and Cox didn’t see much of each other after the groups return to England. On the 17th September, Mitchell drove up from his home in Sussex to London, meeting with Gerry Stickells first and then going on to meet up with ‘Ginger’ Baker [also a Jensen FF owner]. Once at Stickell’s flat, he mentioned to Mitchell that Hendrix had just called. Perhaps he (Mitchell) should give him a call. During their conversation, Mitchell mentioned that Baker and himself were travelling down to Heathrow to pick up Sly. The idea was, they were driving back up to the Speakeasy in London for a ‘jam’ around midnight. Hendrix agreed to meet up at the Speakeasy, he respected Sly’s musical abilities and fancied the chance of them doing a session together. Hendrix didn’t turn up. At 11.45 am on September 18th, Hendrix was admitted to St.Mary Abbot’s Hospital in Kensington. At 12.15 pm Hendrix was pronounced dead. The verdict being that he had died due to inhalation of vomit. His body was transported back to the USA and was buried in Greenwood Cemetery, Seatle. Mitchell flew over to the USA for the funeral, returning back to England immediately afterwards. Once back, Mitchell had stated it was hard to accept Hendrix was dead. Just a month after Mitchell’s return back to England, during November 1970, he was involved in a very serious accident, while driving his FF. 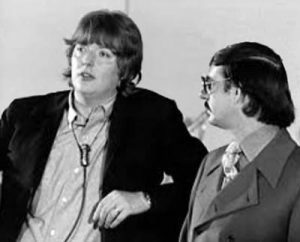 Hendrix’s death must have had an affect on Mitchell’s temperament at that time, and to some degree may have been partially responsible for the accident. The accident occurred at the village of Stonegate, close to Mitchell’s house in Sussex. Mitchell was driving with his girlfriend and their child, fast as usual. Too fast considering the terrible weather conditions. There was a particularly dangerous left-hand bend ahead, and on this occasion a large heap of loose tarmac chipping by one side. As Mitchell went into the bend, he hit the tarmac chippings, which literally flipped 119/195 over tail to nose coming down to rest on its roof in a gully parallel to the road. Miraculously no one was hurt. The three men got to work, putting chains around the floor pans and through the broken windows in an attempt to winch the car back onto its wheels. Eventually they were successful, and by this time, Mitch Mitchell and a friend had returned to check on things. Evans remembered Mitchell in a beige duffle coat absolutely soaked to his skin, “He didn’t look happy, so I tended to talk to his friend,” Evans was to reminisce to the author. Once aboard the recovery vehicle, 119/195 was taken back to Mark Cross Garage and was then later transported up to the Jensen factory. With the FF left at the factory, Mitchell flew off to the USA, but had failed to contact his insurance company about the accident; even Charles Follett, who were acting on Mitchell’s behalf, failed to understand quite what was going on. By January 1971 the insurance company had still not been contacted and the Jensen factory were getting fed up with this dead car taking up valuable space in their workshops. By March an estimate for work had at last been drawn up detailing the cost of repairs at £2,594.44, plus an additional £112.00 for the fitting of a Webasto sunshine roof into the new roof panel. Work to 119/195 started in late March, with Mitchell requesting the car to be re-sprayed in Jensen Tangerine, instead of the unique purple metallic colour the car had originally been ordered in. It was July 1971 by the time Mitchell collected 119/195, but he didn’t keep the car for much longer. Mitchell was ready to sell, and telephoned Buckley offering him the Jensen if he still wanted it. A surprised Buckley travelled straight down to Mitchell’s Sussex farm and purchased 119/195. David Buckley (Eddie Buckley’s son) remembers the stunning tangerine Jensen FF. “My father was really excited when he bought the car from Mitchell. In fact his excitement with his new car hadn’t gone unnoticed by his employees. One of the Company’s cartoonists did a cartoon of the tangerine Jensen, with my father’s head hanging out of the window, and with a speech balloon saying, ‘Can’t be bad, can it’. My father was tickled pink when it was presented to him, and the framed cartoon resided in our living room for many years. 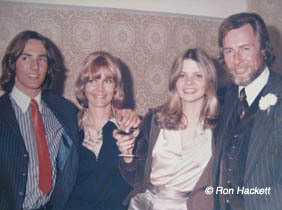 Ron Hackett (right), photographed in the 1970s, with his daughter, wife, and son. “we were on holiday visiting my wife’s parents in England, and at the same time wanted to buy an interesting car, drive it over to the continent, and then ship it back home. Guy Salmon happened to be in the vicinity, and I popped in to see what cars they had for sale. I was taken by a red [tangerine] Jensen FF, and was particularly intrigued by the technical developments wrapped up in such a beautifully designed car. The Jensen’s registration number was YML 41H. I remember the number so well, as I had kept the plates back after registering the car in Australia, and kept the plates on my garage wall. I later gave the plates to the Jensen Museum. Anyway, striking a deal with the main sales guy, Tom Dillon, I bought the Jensen, and drove it around the UK. Before leaving the UK we had the Jensen serviced & noticed that the transmission oil was a little dark, but Guy Salmons thought it would be okay. So off we went on our tour. After leaving Paris for Lyon the Jensen started losing gears & we arrived in Lyon in first gear only. At this time,forget getting any service for an American gearbox in France, so we arranged for the car to be transported on to Genoa , where we had planned to ship the car to Australia anyhow. Meanwhile, we continued on our continental trip in a rental before flying back home. Hackett kept 119/195 until 1976, and then put the Jensen up for sale. Tom Wenkart owned a number of private hospitals in Sydney, and heard about the Jensen FF for sale. Wenkart continues the story, “It was June 1976, and winter in Australia was bearing down in its rather minimalist way. I was determined to buy a sports car of some note. But the specific criteria was not an easy one to find. Working in Sydney convinced me an automatic was the way to go, to make extensive driving a bit more pleasurable in Sydney traffic. Having two young children required some back seat needs, not just the token seating as in almost all other main brand sports cars. I looked at all of them, then available. Fortunately through a friend ( Wendy Collins ) it was suggested that I have a look at this Jensen FF for sale. A smart looking sports car with fire engine red body and black vinyl roof which also had a retractable sunroof. It looked stunning to my limited experience and I was sold. Yes, it was state of the art in those days. A real celebrity vehicle with a pedigree to match, about which I knew nothing for many years. All the mod cons of the day were in it. Even an eight track tape player. Hackett mentioned he had over heating issues with the engine, and fitted another type of fan. It helped, but was just adequate. Finally in 2012 it let me down travelling on a very hot day to a Jensen Car Club event up in our Blue Mountains outside of Sydney. I had a boosted Bosch fan fitted which even on very hot days and laboured traffic situations, meant the car hardly went above ‘N’. 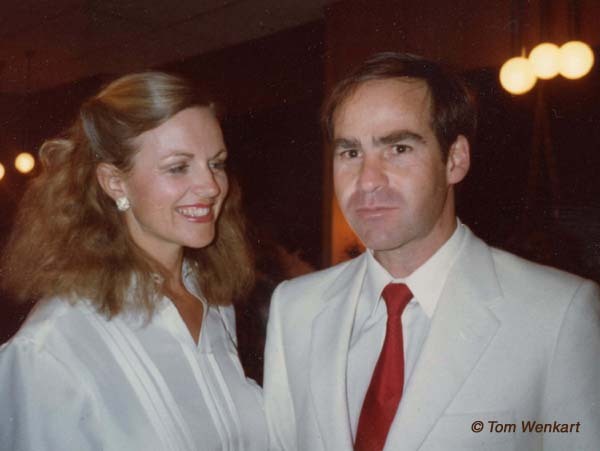 Tom Wenkart and his wife Christine photographed in 1981. Sometime later I did get a personalised number plate for the car, ‘TRW 000’. My agenda was only ever to use the Jensen sparingly. I realised I was the custodian of a rare and imporant car, and I felt it my duty to look after it as best as I could. Tom Wenkart standing next to 119/195 in 2015. 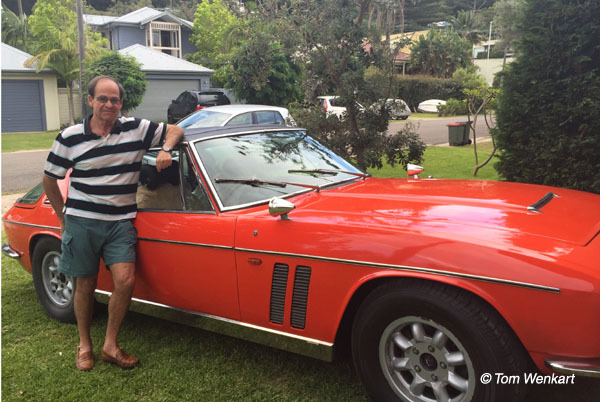 In 2010, I was contacted by Kris Ashton, the editor of Australian Classic Cars, they did a feature on my Jensen FF, which was published that year. The completed article covered three pages of the magazine, and came out in April 2010. 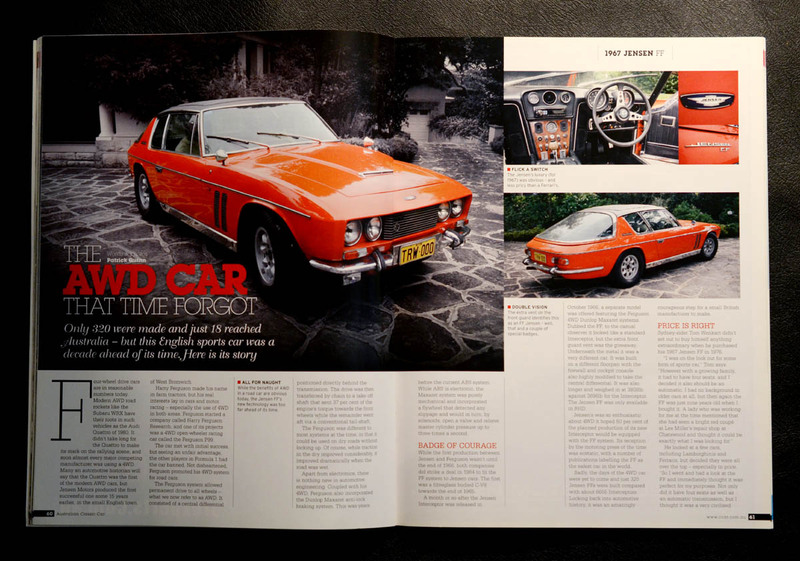 The story of 119/195 in the April 2010 issue of Australian Classic Car. As an aside to the Jensen, the history of Offset Alpine Printing Company is worth noting. Ron Hackett later sold his printing company out to Packer Interests, who in turn sold the company on to a bunch of crooks. They successfully pulled off a huge insurance claim for about $70 million in 1993/4/5 for a fire that destroyed the printing company. Then as the claim started to unravel some years later, many infamous and famous business and political persons in Australia were implicated, some jail terms followed. It was one of the largest commercial skullduggery exposures ever uncovered in Australia. Ulric Woodhams, of the Jensen Museum, had maintained contact with me from the 1990s. He had always made it clear that he would be interested in acquiring my Jensen FF. It wasn’t until 2010 or there abouts that I gave thought to selling the Jensen. It wasn’t that I needed the money, it was more a question of thinking what the best future would be for the car. 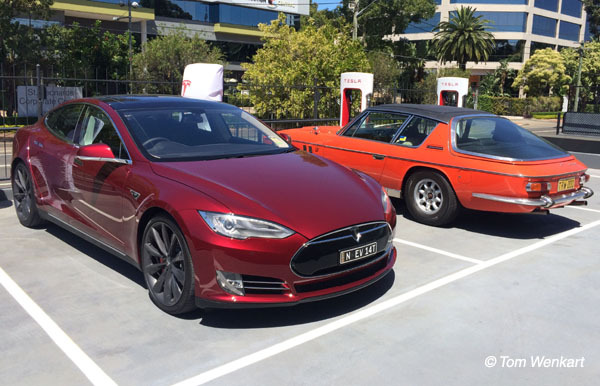 119/195 photographed alongside a Tesla, at the Sydney Tesla Dealership. 119/195 aboard the Salahuddin bound for England. Photograph taken March 2015. 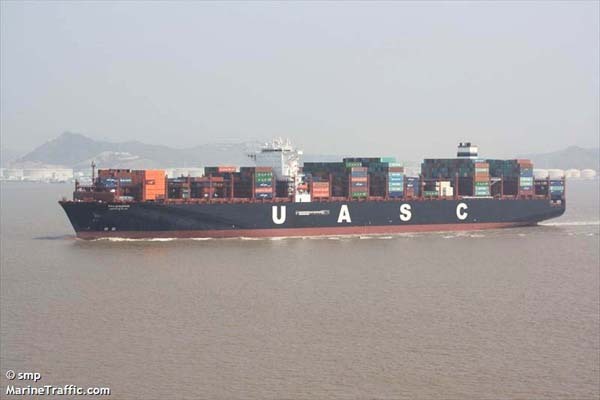 119/195 left Sydney on 9th February 2015, bound for England. The month long journey, gave the Jensen an arrival date of 18th March 2015 at Felixstowe. After importation and registration, the Museum managed to have the DVLA re-assign the original registration number YML 41H. 119/195 photographed shortly after arrival from Australia. 119/195 photographed at Shelsey Walsh in the autumn of 2015. 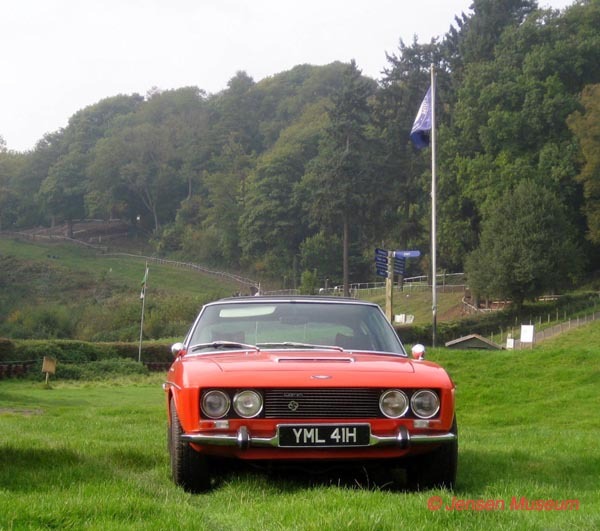 Body: Tangerine paint original to the 1970 respray by Jensen Motors. Webasto roof. Minilite wheels (these still being the originals fitted for Mitchell in 1969). Bullet style wing mirrors. Also Jensen type waistline body anti-bump mouldings are fitted to the car. It isn’t clear if these were fitted for Mitchell, or for Eddie Buckley. Ron Hackett remembers them being on the car when he purchased it in 1973. It is the Museum’s verdict these should be conserved. Interior: Pioneer ‘8’ track player (still insitu). Radiomobile 980 (removed by Tom Wenkart and now lost), we shall have a Radiomobile 980 unit fitted back in place. Mechanics: A post-Jensen Motors air-conditioning system has been fitted. It isn’t clear if Mitchell had the system retro-fitted to the car, or if Eddie Buckley had it fitted. Ron Hackett remembers the air-conditioning was in the car when he purchased it. It is the Museum’s verdict to conserve the retro-fitted system. The car was of sound structure with little rust in evidence. 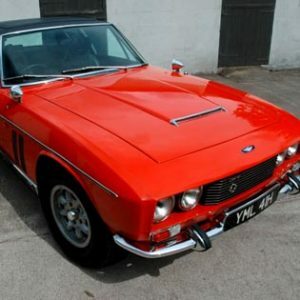 The car remained on its original tangerine paint applied by Jensen Motors after the accident by Mitchell in 1970. 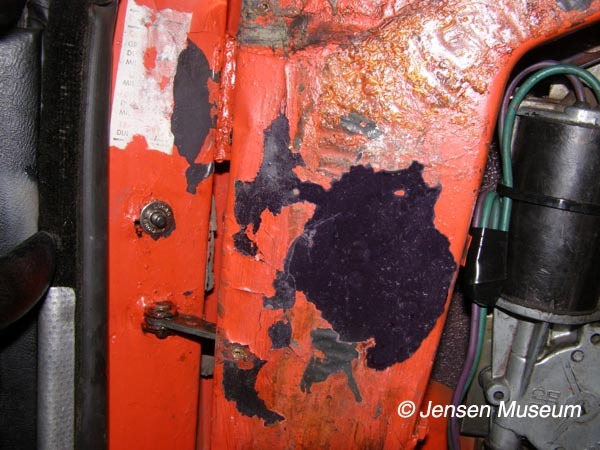 Further detailed inspection found various areas of the original metallic purple paint, including large areas remaining behind the interior door trims. We have been able to spectrograph the colour and now hold paint swtches of the metallic purple paint within our Paint Archive. Original metallic purple paint visible after the door trims were removed. This section was enough to spectrograph the colour and to get a perfect match. A sample of the spectrographed metallic purple paint poured over an FF wing (not 119/195) to give an impression of the colour. Rust was found along the bonnet front inner frame. Of importance, was to cut out this rust, weld in fresh metal, without disturbing the original tangerine paint to the skin. This work was achieved, and a perfect paint match applied to the new area of inner frame. Mechanics: Various up-grades have been fitted to the car such as a high efficiency Bosch fan system. While being left insitu for the present time, the longer term aim is to replace these with standard fitments. As mentioned previously, the retro-fitted air-conditioning system will be conserved. Interior: The original black leather trim is still present, and remains in particularly good condition. The particularly good preservation is on account of the perfect garaging conditions that Wenkart kept the car in. All original Wilton carpets are present apart from the driver & passenger front carpets, which had been replaced at some point in Australia. The Museum intends to deal with the interior from a preventative conservation method, rather than undertake any physical restoration. As mentioned earlier, a modern radio will be removed and replaced with a correct to specification, Radiomobile 980 radio.